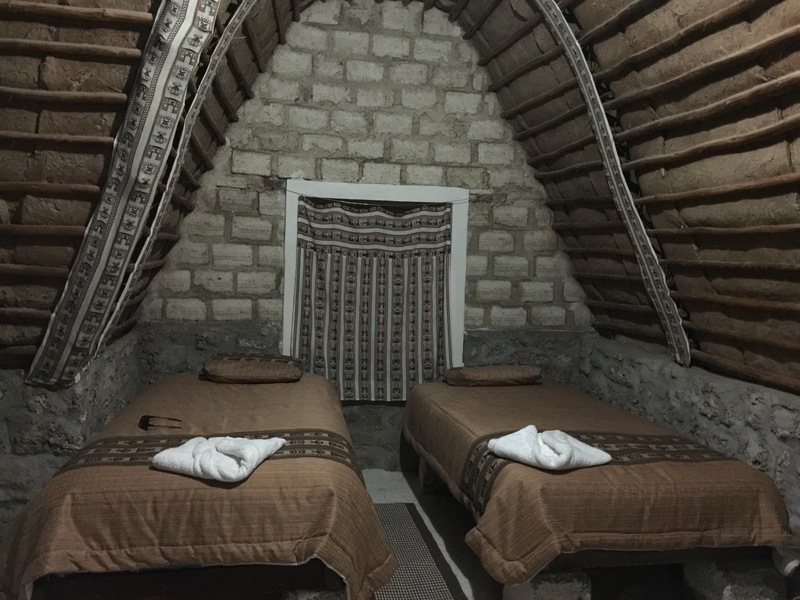 After getting in around 3am on the train into Salar de Uyuni we had a reasonable lay in. It was cold but the hotel had heated floors and a decent breakfast with pancakes! 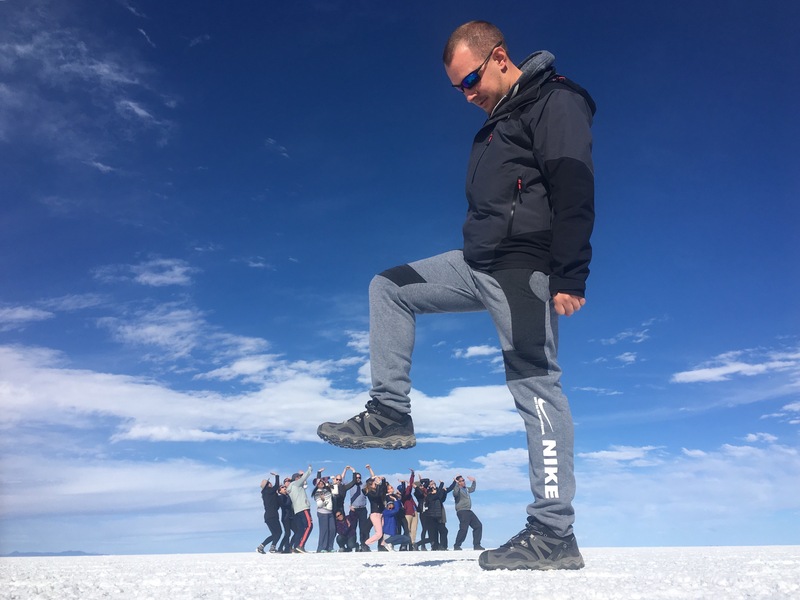 We assembled at 10am and met a new CEO; Vlad, who was going to be taking us across the Bolivian Salt Flats and desert. First we walked to the dust bowl of a town market to get supplies for our 3 days of 4x4ing. An essential pick up was a toy (we chose a Godzilla) to take perspective photos with on the salt flats. At midday our four 4×4’s arrived and we loaded up and set off. First stop was the train graveyard. Bolivias railway system dates back a hundred years and many of the old trains were left here for repairs that never happened. Now there are dozens of trains left to rust in the open. The group clambered over them taking various selfies and photos. Flying the drone we could see the vast scale of the place and the rusty trains all stacked up. Many had been painted in vivid colours and had their essential parts removed. What was left was an eerie place like we hadn’t visited before. Next we headed towards the famous salt flats. But first we stopped at a tiny village on the edge where there was a small museum and lots of stalls selling llama wool jumpers. The small museum was in Spanish but had lots of miniature models showing the salt flats; how the locals harvest the salt; villages; and lots of miniature llamas complete with real llama poo! After a quick visit and look around the stalls (of which all the girls bought jumpers) we headed to our main destination. The horizon turned from the brown desert to white and shimmering mirages began. 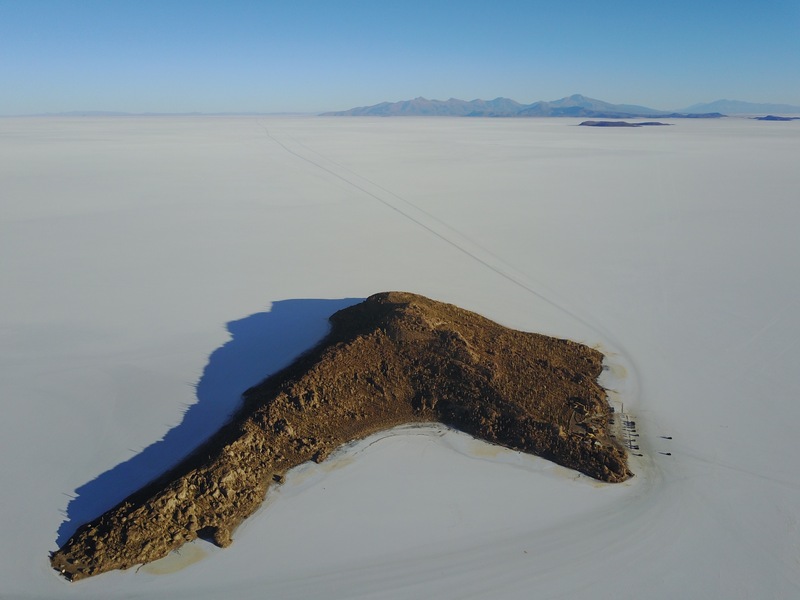 The edge of the salt flats were a mixture of brown and white, not the pure white. Mainly due to it mixing with the dust of the desert. We stopped where locals had piled some salt into large mounds. We stood on top and took photos and could start to appreciate the vastness of the flats. White in every direction, and completely flat. It made the surrounding Andes even more impressive. Continuing for another 20 minutes or so we stopped at the sign for the Dakar rally. 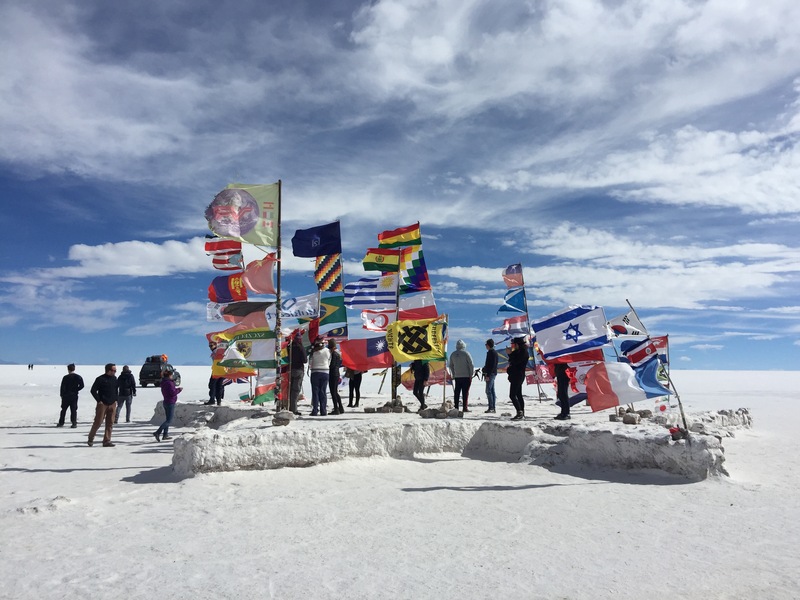 A huge rally with sports cars, rally cross and motor bikes that starts on the salt flats as the cars race between Bolivia, Peru and other countries. After a photo in front of the monument we walked a short distance to the only building on the salt flats: a hotel built before the government put in restrictions. Next to the hotel tourists and put up and tied their countries flags. As a result dozens stood flapping in the breeze. We identified flags and took pictures next to the Union Jack and the South African flag. We then drove for 40 minutes into the centre of the flats. They went on and on and we suddenly stopped in the middle of nowhere. Not a person or car to be seen. Here we had a lot of fun. Because of the flats being so flat; nothing on the horizon; and the sky so blue, it is easy to take funny perspective photos. We started off with a classic: Vlad layed a Pringles tube on the ground in front of the camera, which was also on the floor. We all went off into the distance so we looked smaller than the tube. Glad then filmed and we danced what looked like out of the Pringles tube!! Next, I stood close to the camera while everyone else went far away again. I raised my foot up while they all cowered like they were going to be squashed! We must of spent around an hour there taking silly photos. Some include us fighting Godzilla; pushing up a Bolivian flag; giant me holding tiny Mike, among many to name a few. Lastly Mike flew the drone and took everyone’s picture, we then stood in a circle and our shadows looked like the people and us the shadows. We all laid down in a circle and made a star shape and finally formed SOS with our bodies which from above looked amazing. Especially against the vast emptiness of the salt flats. We loaded back into our 4×4’s and continued to an ‘island’. A boomerang shaped piece of rock covered in cactuses, some believed to be several hundred years old. In the middle of the flats it rose out, thus making it look like an island. We hiked to the top and surveyed the surroundings. Nothing in all directions. The hike was hard as we were now at altitude but worth it for the view at the top. 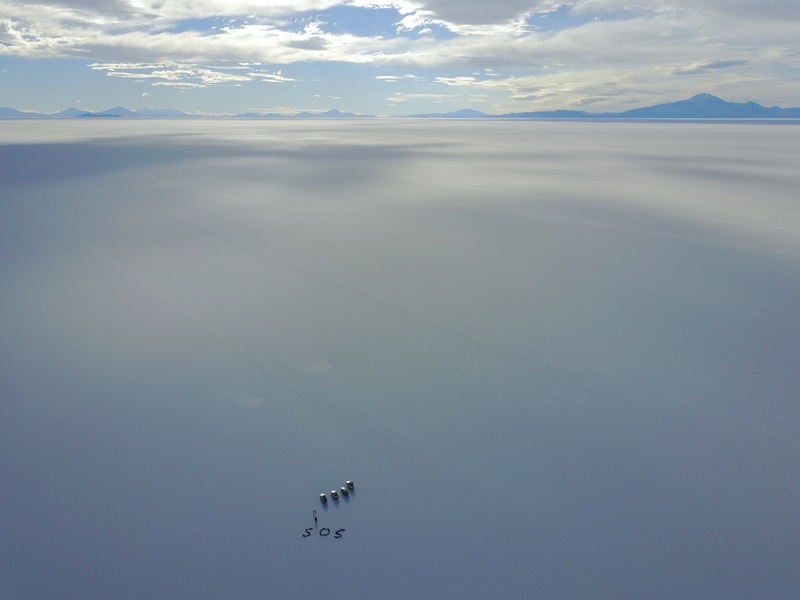 Again we flew the drone and saw this strange piece of land in the vast emptiness. The sun was beginning to set as we sped across the plains. We stopped and watched it dip behind the distant Andes and felt the temperature drop immediately. Sun gone we sped towards the other side of the flats. After an hour and half we had crossed the flats and arrived at our home for the evening: huts made from salt and mud with thatched roofs. Inside they were huge and our beds and many thick blankets to protect us from the cold. 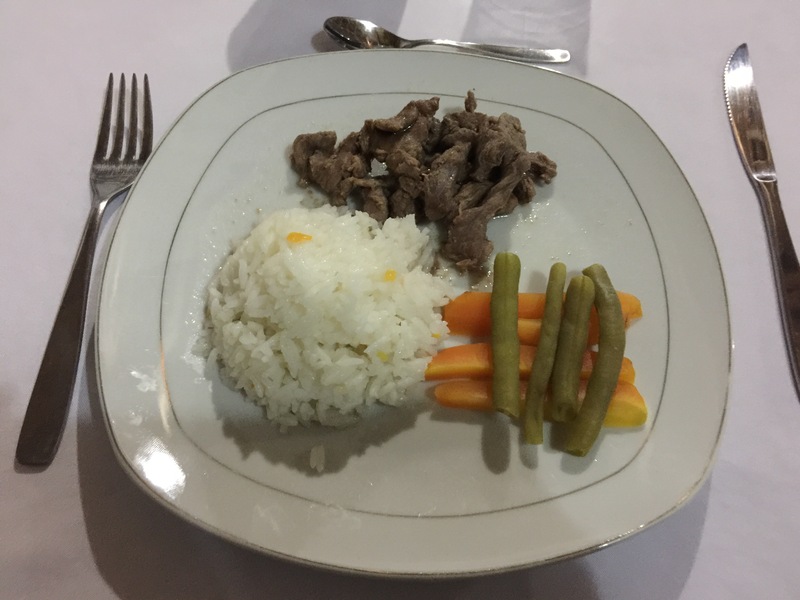 Dinner consisted of quinoa (one of Bolivia’s main exports and grown in the arid conditions) soup and braised llama and vegetables. The llama was tasty but quite salty. The quinoa juice was however a required taste. After some cards everyone headed to bed early and tucked under the thick blankets as the stars shone above.